Epson developed the Epson WorkForce AL-C300DN colour laser printer to provide small to medium sized businesses with an effective and efficient printing solution. Paper use and waste can both be drastically reduced with help from the Epson WorkForce AL-C300DN duplex printing feature. The high yield of Epson WorkForce AL-C300DN toner cartridges also cuts printing costs because cartridges need to be replaced less frequently. The Epson WorkForce AL-C300DN duplex A4 colour laser printer is grey in colour, weighs just over 28kg, and measures in at 444 x 544 x 350mm. Each one of these printers comes with an AC cable, starter toners, a setup guide, and all of the software and utilities required to install the WorkForce AL-C300DN printer with ease. The LCD screen of the Epson AL-C300DN colour printer is clear as well as easy to read and navigate. An additional paper tray can be added to the 250-sheet and 100-sheet multi-purpose input trays which come with this printer. The main advantage of the Epson WorkForce ALC300DN workgroup laser printer is its impressive ability to save both time and money. Another Epson WorkForce AL-C300DN asset is its several different connectivity choices, which include gigabit Ethernet support and a variety of PDL printer emulations. The Epson AL C300DN WorkForce printer is also an environmentally friendly printer because of its Energy Star compliant designation and paper saving duplex printing feature. Printing speed for the Epson WorkForce ALC300DN for both monochrome and colour documents is up to 31 pages per minute. 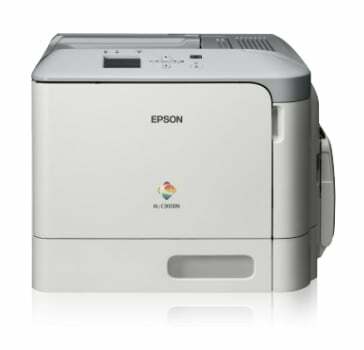 There are no obvious disadvantages to the Epson AL-C300DN A4 laser printer apart from this printer's lack of wireless connectivity.